MapEngine’s Map Query feature puts more asset data at your fingertips–spatially. Create on-the-fly queries in Maximo that spatially display your results. In the past, you could search for an asset or location that matched a given value. Now if you can think it, you can search it. Map Query lets you search on any asset or work management data (status, owner, date, description, and more) and see it on the map. The search criteria are fully configurable. Filter your query results spatially. Perhaps you want to filter your results further by selecting only items in a certain area or boundary. 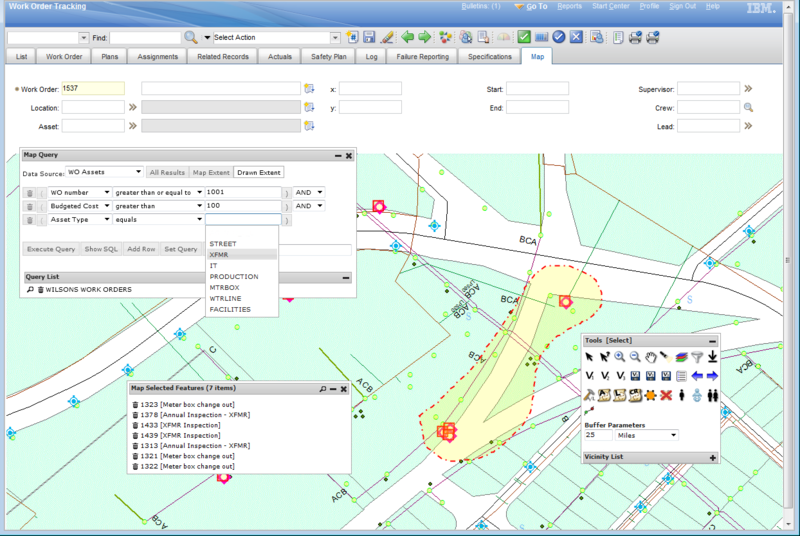 Just draw a polygon to define the area you want and filter your results to that area. Or create a user-defined buffer on a point, polygon, or linear asset to filter your query results. Save your most frequently-used queries for repeat use. If you’ve got an assigned area that you manage, or a certain asset type to monitor, build your query once to suit your need. Then reuse it over and over. A crew chief, John, is out on leave. His work for the needs to be reassigned to others quickly and efficiently.You have GPS on your vehicles, so you can see your crew locations on the map. You need to find all work orders assigned to John and distribute them to one or more available crews.You also need to assign John’s work to the crews closest to the respective work order locations. Define a query to find John’s work (i.e. by assignee/lead), then view it on the map. Filter your results by creating a 7-mile buffer (the distance a crew an travel in a day) on a given vehicle and rerun your query. Use the map results to reassign John’s work that falls into the buffered distance to the other crew. 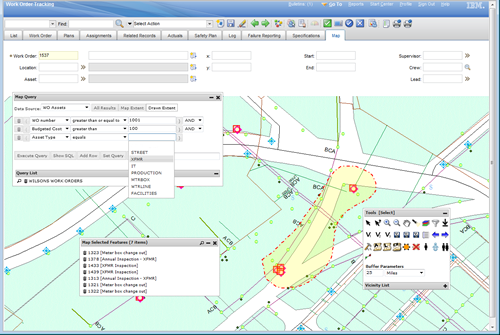 There are many other scenarios where MapEngine’s Map Query can be used to speed up and simplify the process of managing work or managing assets in Maximo. To find out more, contact us here at activeG. This entry was posted in MapEngine, News on February 7, 2012 by ActiveG.